From the complete results of the 42K-Men of the 2008 Pasig River Marathon (International Philippine Marathon 2008), my Official Time is 4:49:03 hours. Overall, I finished No. 417 out of 824 finishers. 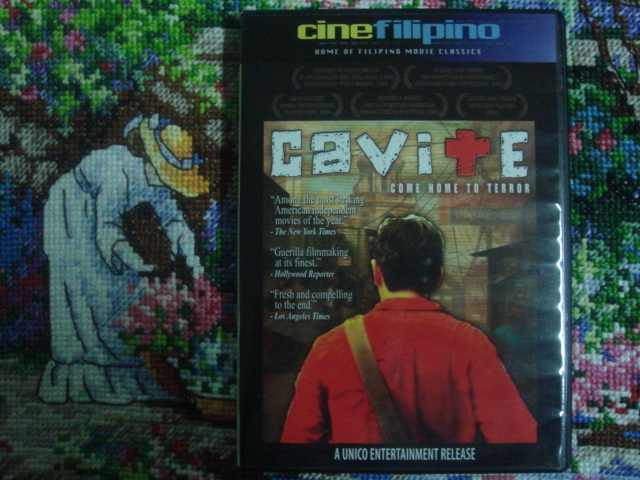 When I last visited my family in Los angeles in December 2006, my daughter asked me if I’ve seen the movie “Cavite” and I was surprised to hear the title of the movie and I said “No”. That was the first time that I heard about that movie and I didn’t bother to ask further questions. However, my daughter recommended that I have to see it or look for a DVD copy of it. On the day my daughter left Manila for Los Angeles last 22 February, she gave me a DVD original copy of the movie as a gift which she bought at Powerbooks at Powerplant. From its pack, the movie is an “indie” or an independent movie which was made by non-popular movie outfit, actor, producer, etc. I tried to play the DVD to my notebook but it could not play it because the DVD was not made for my notebook’s DVD player. So, yesterday, I asked one of the officers at the Transient Facility to set-up a DVD player in our living room. Well, the movie’s story/plot is nice and I can relate myself with the movie as I was once assigned in Mindanao when I was a young officer fighting the MNLF in Maguindanao and lately, in Zamboanga City and Basilan fighting the Abu Sayaff Group (ASG). I don’t want to tell the story/plot but if you are a Christian or non-Muslim, you could see another perception/insight of what and why violence and terrorism still prevail in Mindanao in the eyes and minds of the Muslims. Note: This movie is a “fiction”! After telling Patrick Concepcion a.k.a “RunningShield” that I am going to be at the 2008 Condura Run as an answer to his invitation in one of his comments in my Road Races Page, I was thinking of an “alibi” or reason to tell him why I could not join the said race. This is what I hate to myself because whenever I make or utter a statement, I tend to stick to it and do it no matter how things will affect on me and to other people. So, for the past days after the 2008 Pasig River Marathon, I’ve been moving a lot in my camp, inside our Transient Facility, walking within the garden and parking area of our Field Service Support Unit Compound (where we repair and maintain our mobility assets, firearms, and equipment) while making calls to my wife, command staff and unit commanders, get a two-hour body massage (for the price of P 200.00), and lots of walking inside SM City (where I bought 3 DVD movies & ate at Ted’s Batchoy). However, while I was still in Iloilo City, I got an invitation from my brother telling me to attend to his oath-taking ceremony with the President/Commander-in-Chief for his promotion to Major General (two-star General) on the morning of Friday, 29 February, in Malacanang Palace. As a member of his immediate family and as my younger brother, I have to attend the said occassion. Well, I have a valid reason again to be in Manila and be able to run in the 2008 Condura Run. Hopefully, with a short notice from my staff in Manila, I requested them to have me registered in the said race for the 10K run. Before I left Iloilo City Airport for the last flight to Manila, I just got a word that my race packet is already waiting in my quarters. As of this date, Thursday, my body and leg pains are gone and can positively say that I’ll be running the 10K race this Sunday. To my co-runners, I’ll be running as the bald runner, I mean, without my runner’s cap! See you there! After the Marathon Race, having done my post-stretching exercises and changed my wet running attire, I immediately left Quirino Grandstand and looked for a place to eat breakfast together with my staff/support team from a nearby fastfood outlet. I rested in my quarters after a cold shower and later had my lunch at Causeway. I spent the whole afternoon sleeping and fixing my things to be brought back to my camp. At 5:00 PM, I was already on my way to the airport to catch my flight back to Iloilo City and while I was at the boarding area, I was able to post my picture and story about my run at the 2008 Pasig River Marathon. I did not have any limp while walking but my leg muscles were really sore! I still have my intermittent coughing which disturbed my seatmates inside the plane and I had to cover my mouth with my handkerchief every time I cough. A lady passenger sitted beside me was annoyed with my coughing and I tried to smile and said “I am sorry” at her but she just stared at me. After an overnight stay in our Army Transient Facility in Iloilo City, at 9:00 AM of Monday, I attended a conference presided by the Presidential Assistant for Western Visayas and a staff of the Office of the Presidential Affairs on Peace Process together with the AFP Commanders and PNP Regional and Provincial Directors in the Region VI, in one of the Function Rooms of Hotel del Rio in Iloilo City. Our agenda was focused on the implementation of the Peace Agreement between the Philippine Government and the RPA-ABB (a breakway faction of the Communist insurgents operating in Western Visayas). The conference ended with a lunch and after leaving the Hotel, I was already on my way to my camp in Jamindan, Capiz which is 2 1/2 hours ride by land. On the following day, rains fell hard in Jamindan but this did not prevent one of my visitors to visit tha camp. I received and entertained a regular officer (Lieutenant Colonel) of the US Marines who is a Filipino. Being an Ilonggo, he had been helping my Command by sending medicines and books for the people living inside the military reservation and camp. He even supported the repairs of one of the primary schools situated in one of those far-flung barangays located inside the military reservation. In the afternoon, I have to send-off one of my Battalions for deployment to Negros Island and gave them a “pep-talk” to inform and inspire them of their actual mission in their area. For today (27 Feb), I am going to preside and speak as the guest of honor during the turn-over of command of my Military Intelligence Battalion in Iloilo City. Later this afternoon, I’ll have time to do some brisk walking and slow jogging at the Iloilo City Sports Complex Oval Track. After dinner, a nice Sauna and Body Massage to relax my muscles at Riviera Spa (Iloilo City) for P 200.00 would be most welcomed! 1. Don’t be “mayabang”(boastful)—This was the exact words from my wife when I told her that I was coughing the day before the marathon. Travelling by land for two straight days in the island of Negros just to fulfill my mission to visit my troops and give them their specific mission in the island in person, made a “heavy price” on my health status barely few days before the D-Day. I should had rested when I reached Iloilo City and should had cancelled my oval track run where rains poured on me while running. Sometimes, I forget that I am almost 56 years old and my mind would tell me that I still have the body and strength when I was in my 30s whenever I have my daily runs. This is the most significant lesson I’ve learned in preparing for a marathon race—there is no way I could reach and attain my previous PR time when I was in my 30s! However, breaking sub-four hours in a Marathon Race will be a nice goal after my retirement from the service. 2. Taper and Rest—I guess, my 14 weeks of training for the Marathon Race were not enough to improve my time but just enough to finish the marathon without any injuries or illness after so many years of not training for road races. I should had made my last long run two weeks before D-Day and slowly tapered and rested in the next few days. 3. From “low-tech to high-tech”—I thought my GF 305 does not have any backlight. It was my fault, I usually do not read the manuals of “high-tech” items, as long as they work, it is fine with me. My thanks to my blog-friends for telling me more about my GF 305. 4. More mileage & “speed” runs—This is obvious! After retirement, I will try the Lydiard Method of Training. I guess, I have more time to run with no more pressing responsibilities to attend to. Having my grandchildren to “babysit” will be another story! Ha! Ha! Ha! 5. Sports Gel & Enery Drinks—I have 100% belief that Sports Gel (Gu) and Energy Drinks (Gatorade/Red Bull) give a runner more resistance and strength in marathon races. I consumed at least 8 pieces of Sports GU (Vanilla & Chocolate flavors), a dozen of plastic-bottled Gatorade drinks (from 30 Km mark to the finish line), a dozen of bottled water, and one bottle of Red Bull! 6. ASICS Running Shoes Forever!—This will be my running shoes, for training & road races, from now on. I have ordered an ASICS Gel-Kayano 14 from my wife as my “gift” to myself for finishing the 2008 Pasig River Marathon. 7. Start Getting a Running Partner—Since I am alone in my training for the past four months, I didn’t have any training partner except when my son was visiting the country. However, in marathon races, I randomly look for runners whom I think would be a “companion” while running. Sad to say, they have a faster pace and compete with me and sometimes, other runners could not cope up with my pace. I tried picking up a 19-year old boy (with a nice running form) as my running partner at JP Rizal, Makati but after giving him a bottle of water, he just slowed down. At the Pandacan Bridge, I tried to run with a guy who is older than me but ultimately, he walked later along the way. I guess, I need to join one of the Running Clubs at The Fort in order to look for a running partner in marathon races. 8. Going Back to the Gym—Definitely, I am going back to the gym again to strengthen my calves, thighs, and hamstring muscles. For the past 3 months, I avoided the gym and wanted to reduce my weight by 3-5 pounds and put more time to running. I found out that running is not enough to make your legs more responsive but I need light and high repetition workouts for my leg muscles. 9. Always “be positive”—Even if I knew I was not 100% healthy & fit a day before the marathon, I knew I could finish the race based from my past experiences and training/preparations. On the last 10 kilometers or 6 miles of the marathon race, everything is about “positive attitude”. You should be able to bring out your “warrior” spirit from your body and pray harder that you will finish the Marathon. 10. Support Team—You have an “edge” and positive outlook if you have a support team to give you the much-needed assistance along the way. You need a photographer to document the event. I really appreciate the wife and children of a runner, aboard a van, taking his still pictures and video along the route. Of course, if you are a blogger, having your pictures posted on your blog while you are running a Marathon give/provide more credibility and fun to your readers.